If we go back to August, I don’t think you will find very many Buffalo Bills fans who felt that their team would be a healthy 5-3 at the midway point. As I wrote earlier in the season, most coaches divide the NFL season into four quarters. The worst a coach wants to be is 2-2 in any given quarter and obviously he strives for his team to be 4-0. The Bills record of 5-3 translates into a 10-6 season. In most years, 10-6 gets a team into the playoffs. This team was not looked at as a potential playoff team during training camp but with eight games to go, they are a legitimate playoff contender. Yes, the Bills got beat up Thursday night by the New York Jets and the question many are asking is the Thursday night version of the Buffalo Bills the “real” Buffalo Bills. I am not sure I have the correct answer but my feeling is that this game was more of an aberration than a true look at what the Bills are. This is a young team that has just recently been put together by a new front office and coaching staff. Many on the team have not played together previously and they are just beginning to know who they are. Last week’s game was on the road, on a short week against a team that is also trying to find their identity. They got beat! Those things happen in the NFL when teams are going through growing pains. While every game is important, the “next” game is always the most important. 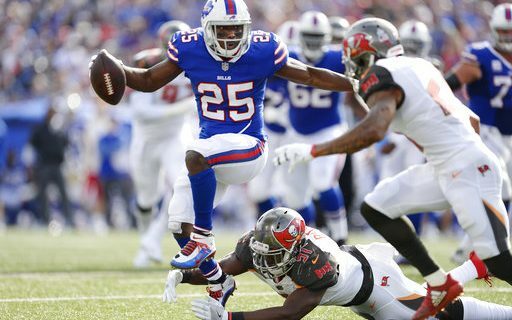 How this Bills team reacts to the Jets loss, and is able to come back against a good New Orleans Saints team will tell us much about the 2017 version of the Bills. A win over the Saints, shows us that this team is resilient and able to overcome adversity. A loss will show us that the Buffalo Bills just aren’t quite ready for to be a contender. In the first half of the 2017 season, the Bills schedule was far from easy. On paper many of those teams have losing records at this point in the season, but most are tough competitive teams that are still in the playoff hunt. Looking at the future schedule, the Bills will also play a difficult schedule. Next week’s opponent, the New Orleans Saints, are one of most improved teams in the NFL and a serious contender for the NFC South title. Following the Saints, the Bills play at San Diego and at Kansas City. San Diego is improved, but still probably the weakest team in the AFC West. Kansas City, on the other hand, is a playoff tested veteran team. Winning in Kansas City will be a difficult task. A side bar to that game is Chiefs Head Coach Andy Reid is a mentor of Sean McDermott and because of that, this game will be extremely important to McDermott. Following that two game road trip, the Bills host New England and Indianapolis. The Patriots are the crowned kings of the AFC East and have been for a decade. If the Bills want to get to the top, they have to beat the Pats at least once this season. The Colts are struggling with injuries to key players,including franchise quarterback Andrew Luck. That game should be a win for the Bills. The last three games are a home game against Miami, a trip to New England, and then they close out the season with a road game at Miami. Miami is struggling and it could very well be two wins for the Bills. Winning at New England will be difficult. As I write this, I see the Bills going either 10-6 or 9-7. I feel they will lose at Kansas City and at New England and beat the Pats here in Buffalo. The key though will be what happens next week at home versus New Orleans. Beat the Saints and the Bills are back on a roll. Lose that game the season could turn south. It will be both fun and interesting to see how it turns out. For more insights from Greg’s 30 years as an NFL scout and personnel man, visit his author’s section at Buffalo Sports Page.